Middle schoolers whiz through the halls, laughing and talking, books in their swinging hands. 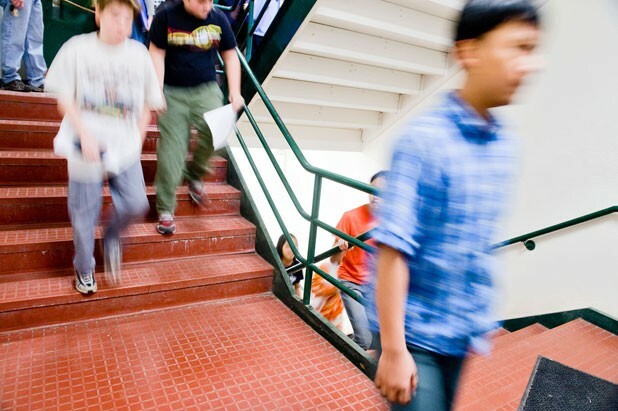 It’s a change of period at Edmunds Middle School, and the students are pounding up and down stairs to make it to their classes on time. Most of them may not give the 19th-century building’s layout a second thought. But Burlington resident and parent Michael Wood-Lewis does. His oldest child uses a wheelchair. Chris Giard, director of property services for the Burlington School District, is winding up a tour of the property, pointing out to Wood-Lewis why students with mobility problems can’t attend the Edmunds schools: stairs, stairs and more stairs. For much of the tour, Wood-Lewis — the founder and owner of neighborhood email listserv Front Porch Forum — has been quiet. But in the stairwell, pausing amid the mingling scents of cafeteria food and stale gymnasium, he voices the question he’s been asking since his third-grader, who was born with cerebral palsy, first entered the school system: When will the Edmunds schools be made accessible to people with disabilities? But supporting accessibility in principle is one thing. Coughing up the money to make it a reality is another, especially in an increasingly alarming recession. Some would say this is the worst possible time to talk about making a ramshackle historic building handicapped-accessible. Others would say it’s the best time, because this is a test case of sorts: As budgets tighten, will the concerns of minorities fall by the wayside? One thing is for sure: With municipalities facing shortfalls, voters aren’t in the mood to approve large expenditures. The City of Burlington has advised the school board to keep its bond item — which will be put to voters on March 3 — below $10 million. A bond in the single-digit millions is more likely to meet voter approval, says city administrator Jonathan Leopold. To many, the accessibility issue is invisible. It’s the sort of thing parents might only discover when they hear their child, who’s headed to Edmunds for middle school, lament that a friend in a wheelchair has to be bussed across town instead. Burlington School District Superintendent Jeanne Collins says making Edmunds accessible is “of critical importance” to the school board. And the larger community? “A small portion” agrees the issue is urgent, she estimates. The issue was highlighted last year when the district ran an audit to tally the shortcomings of its buildings. The result was the original whopping $226 million bond proposal — the largest in the district’s history. The school district now estimates the tab for fixing Edmunds’ accessibility issues alone could reach $15 million. During the winter, Giard is often up at night, checking the temperatures of the schools from his home computer to make sure the heat is working. During one cold spell this year, a frozen water line kept part of Flynn Elementary School at 50 to 58 degrees. Particularly this year. The hefty bond proposal, introduced when the economy was already showing signs of weakness, shocked many voters into voicing opposition. The item never made it to the ballot, and the school board went back to the drawing board. “It was a process of $226 million, then $92 million, then $36 million, then whatever you can give us,” says board member Jurij Homziak. The $9.75 million bond currently offered for voters’ approval passes Leopold’s lean-times single-digit test. It would address some pressing needs: buying boilers for Flynn and Barnes elementary schools, and a new fire alarm system for Smith Elementary. All that’s left of the original plan to revamp Edmunds is $10,000 tucked into the school budget to fund an architect’s study. And if the school budget fails to pass? Wood-Lewis asks Giard, during the school tour. Giard vows to dig $10,000 out of his budget to get the study done. Giard estimates retrofitting Edmunds would run from $10 million to $15 million, and might include such major steps as gutting the school’s central building, then leveling around it to make a ramped entrance possible. Once the work does start, he says, it should be done in one go, because piecemeal solutions might add to the eventual cost. With that price tag, why not just start fresh with a new school? Given Edmunds’ historic status — the middle school was built in 1898, the other sections in 1929 — demolition isn’t an option, and alterations are costly. For instance, an elevator added to the exterior of the buildings would violate the schools’ historic integrity. Any elevator must go inside the school, potentially taking up valuable classroom space. Giard opens the door to an electrical closet that he envisions will become the middle school’s elevator shaft. Below the school’s original pressed-tin ceiling, wires snake their way across the floor and up the wall. The building’s electrical system will need to be overhauled, too, he says, because it can’t currently handle the load from an elevator. Indeed, in some classrooms only two or three outlets can be used at once, Giard adds. To be sure, Burlington isn’t the only Vermont school district dealing with these issues, say school administrators. Many of the state’s schools were built 50 to 70 years ago or more, when design for the disabled wasn’t a consideration. At St. Albans City School, where Champlain Elementary principal Leslie Colomb worked until last year, “we were constantly looking at accessibility issues,” she says. None of that is much consolation to Wood-Lewis. He knows that if Edmunds remains inaccessible to people with disabilities a few years on, his son will attend Hunt Middle School while his friends and classmates enter sixth grade at Edmunds Middle. And, while Wood-Lewis often prefaces his questions about school accessibility by saying that he and his wife Valerie have been advocating for their son for the past six years, he stresses that the issue isn’t just about one child. Advocates for the disabled say that kids who have to meet all-new classmates in middle school face emotional and psychological challenges. “For people with mobility issues, it’s not just physical access,” remarks Connie Curtin, former codirector of the Vermont Family Network, a Williston-based organization that helps advocate for families and individuals with special needs. “Kids with disabilities often have to struggle making friends and connecting” — especially in those difficult preteen years when children aren’t as accepting and supportive, Curtin points out. Of course, Giard points out, Edmunds’ many stairs — the middle school has five levels, the elementary school three — don’t just disadvantage disabled students. Kids who break their legs skiing have to take classes in the middle-school library. School employees strain to lug equipment up and down. And anyone who wants to enter the building — from parents to First Night celebrants to voters — has to face the steps. “When I come up against architectural barriers, I start feeling like the builders didn’t want me there, and by extension, the community doesn’t want me there either,” Allen says. Nestor’s daughter attends Champlain Elementary, which is accessible to students in wheelchairs, though only through the back entrance. And often families that need to use that entrance arrive to find the doors locked, says Parm Padgett, copresident of the Champlain Elementary PTO. She and her husband Jeffrey, who owns Burlington-based Engineered Solutions, have joined other families to do something about that. Jeffrey Padgett is donating his time to work on a plan for a front entrance ramp. Once there’s an estimate for the work, Padgett plans to bring the project to the PTO and begin fundraising from the community. City councilor Ed Adrian is one public official who doesn’t think the price of opening up Edmunds — and fixing problems such as its aged electrical system — is too high. A city needs safe, up-to-date schools to attract families and middle-class residents, he says. Superintendent Collins hopes President Obama’s stimulus plan will provide some funding for improving school facilities, and she’s already working on how to access those funds should they become available. “There’s no guarantee, but the sense is very high that it’s likely,” she says. In a time that’s harsh on everyone, it may be all too easy to ignore the concerns of a minority. Some parents of children with disabilities say they are trying to balance their desire for change against the fear of resentment from other Burlington taxpayers.